Our appreciation of the work of filmmaker Kurtis Hough is pretty much as old as the earliest pages of DN and has grown just as the scope and ambition of his films have over the years. Building on over a decade’s worth of cinematic experimentation, Hough’s latest piece To See More Light is a 15 minute, black and white epic which brings together a variety of techniques employed by the director in his previous work for a film which combines cosmic geometric animations, time lapse lava flows, gnarly tree growths, and all matter of the universe. We talk to Hough about the vastness of nature and the unexpected journeys his organic working methods take him on. Nature has always been a major element of the work you create. What is it about the natural world which continues to fascinate and inspire you? Nature is endlessly vast and when I’m confronted with new formations, they stay with me and sometimes build enough interest to explore further in an art piece. It’s mostly an attempt to satisfy that need to learn more about moss and slugs, glacial ice, lava flows, and see what feelings they can express when taking the time to explore them. How did Hawaii and the words of Leonard Cohen combine to lay out the path which led to To See More Light? Two years ago I traveled to Hawaii for the first time and visited the Kilauea Volcano. 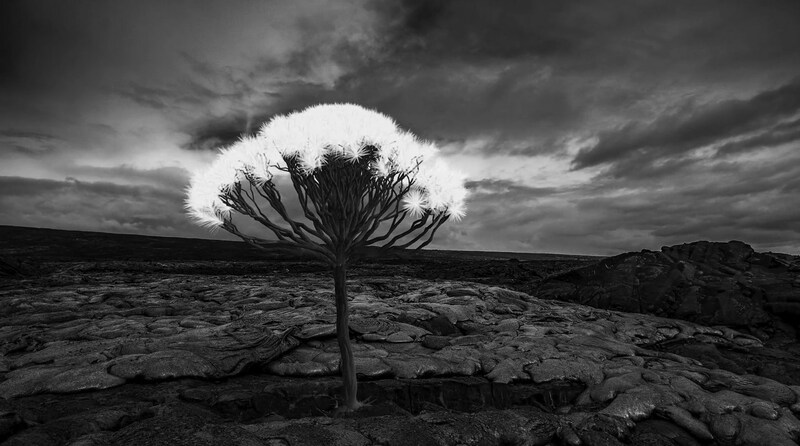 I was fascinated by the movements of lava as it slowly branched out, like a tree, over the land into the ocean. While making the picture Leonard’s words keep creeping in and added a mystical element to what I was making. It feels that your films which came before were a training ground for these 15 minutes. Was that curation of the ‘best’ of the past a conscious decision that went into the creation of this film? Only when it was finished did it feel like an obvious progression, combining many ideas and techniques I had been playing around for years. I enjoy being able to drawn on a host of ways to make an image and see if I can create something new but still connected to older pictures, like a recurring dream. I’ve always loved the organic feel of your pieces but I know that you’re a person who researches and tests extensively. How locked down was the plan for To See More Light and how does the final film diverge from that plan? Typically I start with one idea and shape it as I work, which gives me more time to understand and find its direction. It’s a lot of experimenting and reworking, especially when I play with animation. This project grew into more than I expected at first which took an extra year and became 10 minutes longer, but unexpected journeys like that can make the process more rewarding. B&W is sometimes seen as a reductive, ‘less than colour’ form of filmmaking, but I feel in this instance it renders elements as more abstractly intriguing and forced me to look at the images more intensely. How do you approach filming and animating from a monochrome perspective? Initially this was a color film, mostly orange and black. 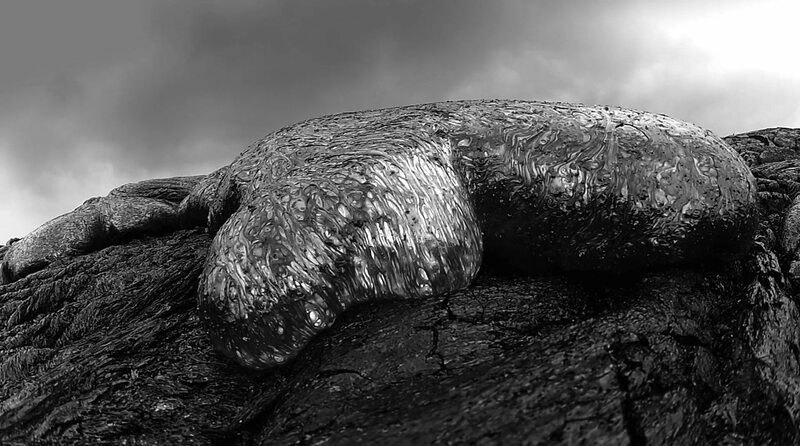 However, once I did a test of the animation and lava scenes together in black and white there was no going back. It shifts your attention to other areas that might feel different if they were in color and makes it all feel more dreamlike. I feel like I don’t dream in color. I feel like I don’t dream in color. Musician Colin Stetson (with whom you previously worked on Cryosphere & In Mirrors) created the film’s soundtrack which began life as a composition of the same name. How did the two of you further develop the musical aspect of the film as you continued to refine the concept over the next two years? Colin’s music shaped the images as much or more than anything else I’ve mentioned. On a basic level, I was trying to achieve the same strange beauty and powerful feeling his notes produce, with images. Once we decided to use the song To See More Light for this lava idea I had, it was me running with it and independently trying to figure out what the music meant and how all these ideas all fit together. I see that To See More Light was supported by the Regional Arts and Culture Council, Oregon Media Arts Fellowship. Over this past decade plus of filmmaking have you been able to consistently find financial support for your projects? Thankfully in the past four years I’ve been getting some support in that way. I probably wouldn’t have been able to devote as much time as I did experimenting with ideas that never made it onscreen if I didn’t have support from local arts organizations. I’m sure you’re already in the midst of several projects which will come to fruition in the years ahead. Can you tell us about any of these and how you see the road ahead forming for yourself as an artist? Stay tuned for Painted Hills at the end of the year which focuses on the geometry of geology, or at least that’s what I think it may be about. I’ll be spending the next months figuring that out.